Dr. Banyard at Little Mountain Veterinary Clinic, is often asked by owners if their pet’s bad teeth can be taken out when the pet is awake or sedated. Much of this is because owners worry about the anesthetic risk to their pet and/or the cost of the procedure. Please go through the slide show to see what is involved in a tooth extraction. All these steps are needed and all of them need a to be performed in a completely still patient. They are ALL extremely painful. The surgeon must be very skilled, and very well trained to do these procedures. As a veterinary dental specialist Dr Banyard has the necessary training. An extraction is not a simple procedure. All of the roots of the teeth must be extracted. In the dog and cat some teeth have one root while others have two or three. To confirm complete extraction an x-ray of the site is needed. Tooth extractions are commonly done in veterinary clinics. They are often very challenging procedures. As they are considered to be surgical procedures by the American Veterinary Dental College. At Little Mountain Veterinary Clinic these are only done by Dr Banyard. The common dangers of extractions include: leaving a root tip in the socket, pushing the root tip into the nasal passages or the mandibular canal, gouging the eye with a needle or a hand instrument such as elevators, damaging nerves or cutting an artery. Training is needed to perform extractions well. To assess a tooth before and after extractions a dental X-ray machine is needed. 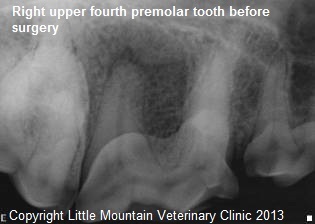 At Little Mountain Veterinary Clinic all teeth are X-rayed before and after extractions. Dr Banyard discusses the findings and treatments with pet owners. No teeth are removed without the pet owner’s permission. If the client cannot be contacted by phone to make the decision no treatment is performed. Please make sure you leave us a phone number where you can be reached on the day of your pet’s surgery.